My husband is a great cook and makes wonderful meals, though he doesn’t bake very often. 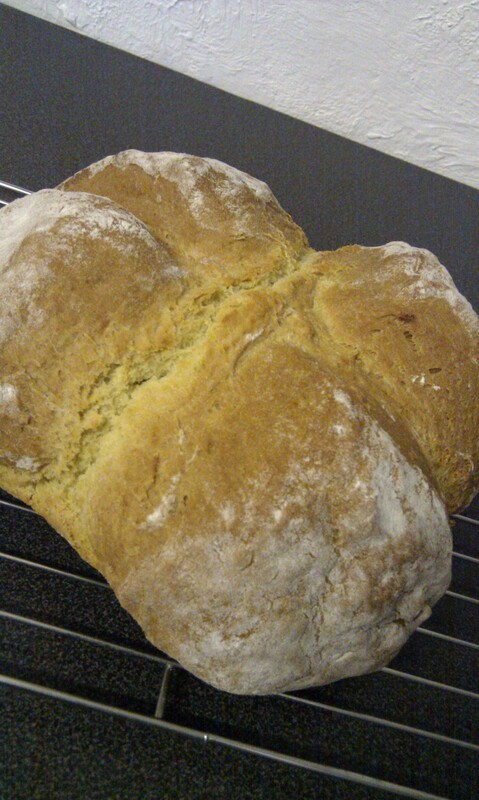 One of the things he is really good at is a Soda Bread. It is an Irish recipe and with him having some Irish blood in his family he makes it perfectly. I remember the first time he made it he was so nervous about getting it right because with most baking you have to be precise with your measurements and ingredients and he wasnt used to this. The first time, like everyone’s first bread, you end up a completely sticky mess as the recipe nearly always needs more flour than it says. He managed it and ever since he has got better at doing it. This recipe is great as a first time forray into bread as it doesn’t take much kneading, rising or proving time. From start to finish your loaf can be ready to eat in an hour and you can make it a sweet recipe to by adding some cinnamon and raisins. Sift the flour and bicarb of soda together into a large mixing bowl and then mix in the salt. Once it is mixed together, turn onto a floured surface and knead quickly, just enough to make it into a loose ball and no more. Put the dough onto a silicone mat or greaseproof paper. Cut the dough with a sharp knife with a cross shape. You will want to cut quite deep but not all of the way to the edges, and make sure you don’t cut all the way though! Generously dust with flour and then put into the oven. Leave to cool on a rack. If you want a soft crust then wrap with a clean tea towel or for a crunchy top then leave uncovered. THis is best eaten on the day it is made and is lovely warm. It also tastes lovely with some butter and jam on it or dipped in a home-made vegetable soup, as we had it for dinner. *If you cant find buttermilk in the then you can make your own by using full fat milk and putting a tablespoon of lemon juice into it and leaving it to stand for 15 minutes before you use it. We usually find it next to the cream in the supermarket. Last year I went on an ‘around the world’ holiday with my husband and family covering Hong Kong, Australia and San Francisco. They had the bread being made fresh in the window day and night and then being placed on a magical system, like a small rollercoaster for bread, which delivered it straight from the bakery next door to the shop! The sourdough bread was fantastic and I thought that it would be something lovely and simple that I could make when I returned back to England. Unfortunately, I was wrong. Sourdough isn’t a simple recipe and after researching quite a few this morning I have realised that it is going to take some planning and practice to create the best sourdough. You see, sourdough isn’t like a normal bread using yeast – it uses a starter. This is a fermented mixture of flour and water which is left to ferment in a warm place and then fed with more flour until it changes from a nasty-smelling mix to a sweet-smelling one. Then you use the starter as a type of yeast, but not in the usual way, you have made the sponge which is made by mixing some of the starter with fresh flour and left over night. All of this bubbling and fermenting is what gives the sourdough its lovely flavour and creates a nice heavy-ish bread. Then finally after all of this process the bread, which can take up to 2 weeks in total, can be made. I think I am going to need a bit more practice at making the simple loaves before I can move onto this complicated one and in the mean time I will just have to think of my happy memories of eating it in sunshine in San Francisco.